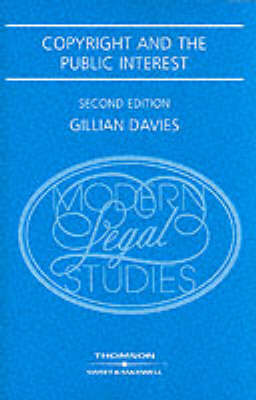 This is a rewritten and expanded new edition of Gillian Davies' well-regarded 1994 monograph examining the basic justifications for copyright, including its moral and economic functions, in the lightof the public interest. Technical developments and the information society have put considerable strains on the copyright system and Copyright and the Public Interest is a thought-provoking contribution to the ongoing debate on public policy in relation to copyright reform and harmonisation internationally. The book is presented in four parts. Part I provides an introduction to the concept of the public interest in the copyright system and explores the underlying principles governing copyright legislation, as well as its origins in Western Europe. Part II reviews the concept of thepublic interest in the history of copyright in the UK, the USA, France and Germany, covering legislation, case law and literature to the summer of 2002. Part III deals with copyright and public policy, considering the moral and economic functions of copyright in relation to the alternatives and the limitations imposed on copyright in the public interest by national laws and the international Conventions. Part IV, which is new to the second edition, discusses the future of copyright. It examines the impact of digital technology on copyright and the legal frameworks required for protection in the world of the Internet. The extent to which recent international developments, such as the WIPO Internet Treaties of 1996 and the European Union Directive on Copyright and Related Rights in the Information Society 2001, have taken account of the public interest are analysed for the first time. A new chapter considers the international protection of copyright and the obstacles to and perspectives for further international harmonisation. In conclusion, the role of the State as arbiter of the copyright system is discussed.